Christmas came early for a Massachusetts family when they received an autographed, working typewriter from Tom Hanks. A family in Wellesley, Massachusetts, received an early Christmas present from one of Hollywood's biggest stars. In September, the de Peysters saw the documentary "California Typewriter," which profiles some of the biggest stars who still use the machine to communicate. Tom Hanks is one of them. That's when Nick de Peyster had the idea to write a letter to the star. In the letter, which was written in September, de Peyster wrote that the documentary inspired him and he asked for one of Hanks' more than 200 typewriters. He added that he is challenging his son, Rowan, to type one thank you note a week. Time ticked with no response. October turned into November and then December. But Saturday, a box arrived outside of their home. "This box arrives, and frankly, I had no idea what it was, and then I'm looking at the return address and it said 'Playtone,' said Nick de Peyster. "I'm like Playtone, Playtone, Playtone!" It's the name of Hanks' production company. Inside the box was an Olympia typewriter, with Hanks' autograph on top and a letter. "He said to use it just the way it was," said Julia de Peyster. 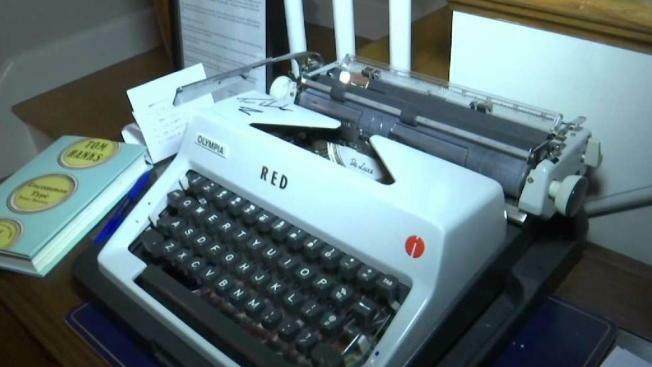 "Just the mechanics of it is really interesting," Rowan de Peyster said about the typewriter. Promises were made, including that one letter has to be written a week and they have to buy a typewriter for someone else. If that doesn't happen, the typewriter has to go back to Hanks.